Perched on a small hill between San Josep and Ibiza Town, Can Babouche offers panoramic views of exceptional beauty. This is a truly stunning property with rich colours and beautiful decoration in a Northern African theme. 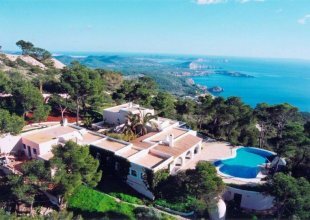 Babouche is located close to the very popular beaches Cala Jondal and Salinas. Ibiza Town is only a 10 minute drive and the villa enjoys complete privacy with lovely mature gardens surrounding the property. Can Babouche is a perfect retreat for those who wish to experience Ibiza in a relaxed and private way. We specially suggest this villa to those who appreciate the combination of traditional island architecture and an informal décor. Can Babouche has approximately 800m2 of living surface and offers 7 bedrooms all with ensuite bathrooms. The property is surrounded by 1 acre of gardens, allowing privacy and complete relaxation. The ground floor of Can Babouche consists of a spacious social area with dining area, cosy snug and living room opening out to the beautiful covered patio and the sun-terraces. There is also a fully equipped kitchen that was recently renovated. There are 2 bedrooms on this floor. The first floor has 5 further bedrooms, 2 of these open out to a large covered terrace with daybeds that overlooks the gardens and the sea. All bedrooms have air conditioning and are decorated in a colourful, bohemian style. The other 3 bedrooms have private terraces and balconies and all bedrooms are spacious and equipped with ensuite bathrooms. Furthermore there is a roof terrace with day beds and sofas. From here you can enjoy views the whole way to Ibiza town and a 360-degree panorama. Various day beds, gazebos and sun loungers surround the large-pool area. The swimming pool is 18 meters long and this area has beautiful palm trees and exotic plants, creating a real oasis feel. The villa staff live on the grounds in a separate guesthouse. The property enjoys mature and exotic gardens with 360--degree views, tennis court, large 18-meter swimming-pool and several outdoor dining areas and chill-out spaces. There is also a large parking and private location.